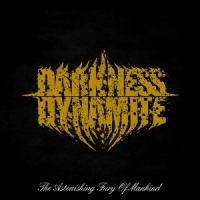 ’The Astonishing Fury of Mankind’ is the title of the debut album by the French neo-thrashers<?xml:namespace prefix = o ns = "urn:schemas-microsoft-com:office:office" /> DARKNESS DYNAMITE... and a solid one I must say, but there’s still room for improvement. Sound and style-wise the band is a mix of several bands; Gojira, Fear Factory, Strapping Young Lad, Devin Townsend, Korn, Pantera. Throw in a bit of metal-core, a couple of death metal riffs and some Scar Symmetry elements... and there you have it. The vocals are rough and harsh and Devin Townsend comes to mind again, however the vocals gets a bit monotonous in the long run. And sadly... even though that this is a solid release... the music becomes a bit monotonous too in the long run. Mostly because it feels like the album has been recorded in several studios. I feel it’s overproduced to put it simple. But don’t hesitate to check this release out... because there’s certainly enough going on in the music to keep you interested. Almost every single track has something to offer. Almost every single track has guitarriffs that will make you turn your head and think: - Wow... what a riff! All in all a solid release, however there’s still room for improvement. The guys haven't burnt their creative powder yet, I am sure!